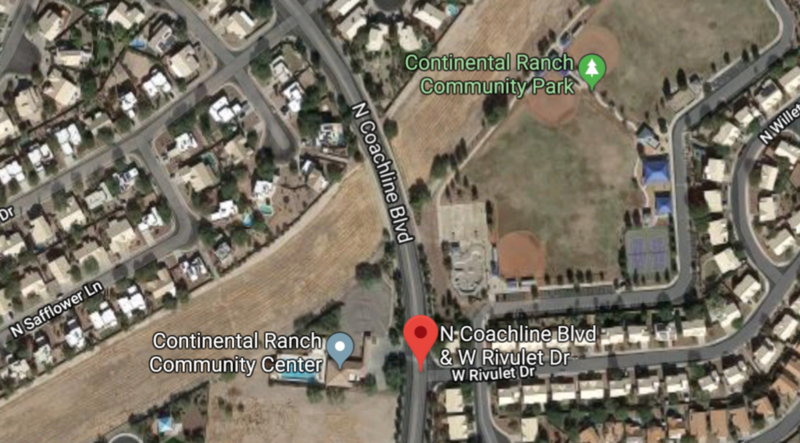 During the week of February 11, 2019, the contractor will begin work at the pedestrian crossing on Coachline Boulevard near Rivulet Drive and the Continental Ranch Community Association Center. Pedestrians and cyclists wishing to cross at this location will be directed to a temporary crossing location during this work. Rivulet Drive, at Coachline Boulevard, will have intermittent closures during this work. Coachline Boulevard will be reduced to one travel-lane in each direction. Traffic will be shifted as work progresses across the roadway. Left-turn movements will be permitted but will not be from a dedicated turn lane. Access to Continental Ranch Community Center will have intermittent restrictions while work is completed. Sidewalk and ADA access at the intersection of Coachline Boulevard and Rivulet Drive will be restricted during this work. Residents who typically use Rivulet Drive should utilize Maple Ridge Drive for access as often as possible while the pedestrian crossing operation is underway. REMINDER – Vehicles parked on Coachline Boulevard will be towed at owners’ expense. *The new pedestrian crossing at Rivulet Drive will re-open after the final paving and striping operation is completed. Weather permitting, paving of this section of Coachline Boulevard is expected to be complete by mid-March 2019.